How to use and setup ClockIt iPad/Android Kiosk for time and attendance. ClockIt supports using an iPad / Android Tablet as your kiosk to capture time and attendance. Download our kiosk app from the link below. Using the kiosk application you can allow all your users to punch time into one app. Employees would use a PIN to authenticate themselves. You can setup the PIN for each user using the Manage Users section. Know more about managing users on ClockIt. ClockIt kiosk also captures photos at the time of PUNCH IN and PUNCH OUT. This allows you to verify that the correct users are punching ant not taking advantage of the system. In addition to this ClockIt Kiosk also identifies users using QR code scanning. 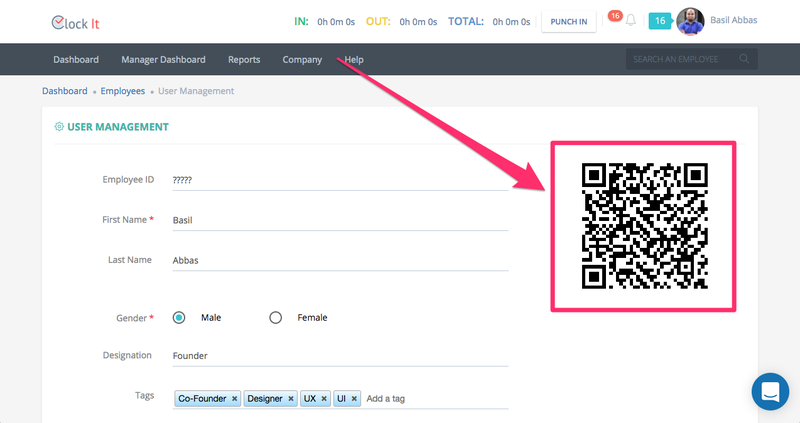 Each user's QR is automatically generated by ClockIt. You can simply download this QR and print them directly on the ID badges used by employees. ClockIt Kiosks can also be locked down to geo fences and allow users to punch in only when the app is within the geo fence. Know more about punch settings.